The first Bundesliga match of the season was played on possibly the most beautiful day of the year so far. In glorious sunshine, a new-look THCC1 took to the field after first-time captain Cam won the toss and chose to bowl. New players included Dominique, Aman and 12th man Raman. Playing on the roll-down mat, the going was slow, with the run-rate of 3 per over bolstered by the wide count. Kamaladin was steady and Bipin economical. 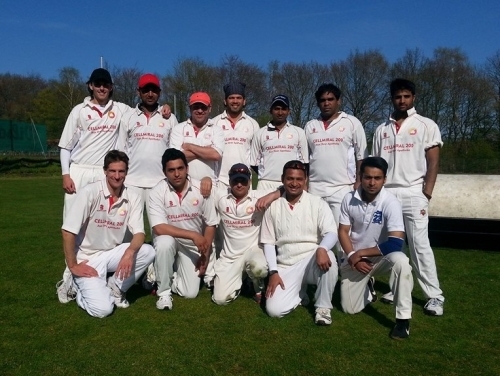 Some sharp chances went down and the batsmen were edging, but no wickets were forthcoming. The true and even bounce was making the mat look like a batsman’s paradise. A bowling change brought a change in fortunes. Israfeel picked up two wickets and Sandeep dislodged the stoic opener Premnath, who batted intelligently for 37. The number 4 batsman, young Daub, also showed impressive resistance and temperament, batting for almost two hours. He was finally removed by Kamal, with the catch and wicket turning the innings in THCC’s favour. Cam cleaned up the tail, just missing a hat-trick and finishing with 5/23. Some lusty hitting at the end took Göttingen up to 164, which included a disappointing 36 wides and 5 no-balls. The chase got off to an excellent start, with Sandeep and Dominique taking the score quickly to 71 before Sandeep edged one to the keeper. Dominique batted on to make a splendid 62 and was well supported by Guru who made 29*. THCC reached the total in 23 overs with the loss of three wickets. It was a solid start to the season. Bowling accuracy and fielding still need a lot of work, but for the first game, all in all it was a good effort. Raman was excellent in his role of 12th man, even fielding brilliantly for Göttingen at the end. Göttingen were excellent opponents, playing in the true spirit of the game, and the return match next weekend in Göttingen promises to be a good one. Thanks to the club members and supporters who watched the match. Special thanks to Tina and Dave who shared the scoring duties.